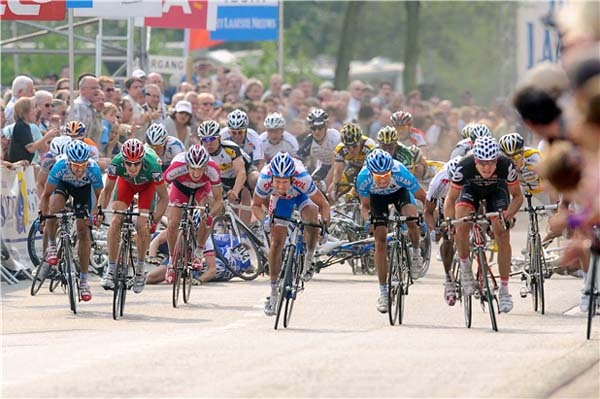 Alessandro Petacchi (LPR Brakes-Farnese Vini) was able to bypass a nasty crash that occurred in the final 200 m of today's Scheldeprijs Vlaanderen in Belgium to take the win. Kenny Van Hummel (Skil-Shimano) and Dominique Rollin of Cervélo TestTeam were able to bypass the carnage to join Petachhi on the podium. Early reports have Greg Van Avermaet (Silence-Lotto) as the first rider to go down followed by Robbie McEwen (Katusha). "Today's race was for sprinters and it was also the last race for our riders competing in the first spring races," said Jean-Paul van Poppel, Sports Director. "With Haussler we had an excellent candidate to challenge riders like Robbie McEwen, Tom Boonen and Alejandro Petacchi and so on. In the beginning of the race there was a four rider breakaway, without anyone from our team, but no worries, as we did control things a little bit with Ignatas Konovalovas and Ted King. The time gap was not more than 6 minutes. When the local laps started we came closer and closer. In the second local lap there was big crash on the cobbles which Martin Reimer from our team was involved in. Haussler was behind the crash but lost contact with the peloton. He did not get help to come back and was on the end not able to close the gap. "Then we tried something in the last lap, Roger Hammond tried to break away together with Servais Knaven (Team Milram) but they got no space so there was a bunch sprint left. We get Dominique Rollin in a excellent position with 150 meters to go, behind him there was another big crash with all the big names in but Dominique was at that moment in the second position and it was Kenny van Hummel who passed him just before the finish line. Again a rider from our team on the podium, so we are pretty happy even though we were unlucky with Haussler he should have been our man today." 10 James Vanlandschoot (Bel) Verandas Willems, all s.t.